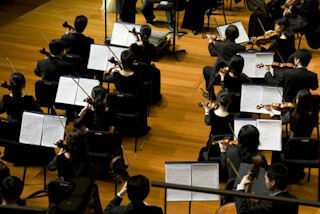 Have you ever attended a live symphony orchestra concert? Or listened to a piece of classical music by one of the great composers . . . Beethoven, Mozart, Mendelssohn, Brahms? Just close your eyes and be transported to a whole different time and place . 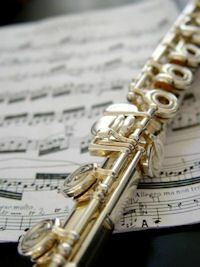 . . the flute becomes a nightingale, the cello a flowing brook, the tympani a crash of thunder. And somehow the composer knew exactly the right way to combine the thunderous and the delicate, the highest highs and the lowest lows, as skillfully as nature herself. Liat and Eran were lucky enough to attend a concert just like that yesterday, as Jonathan gave them tickets to see the Israel Philharmonic perform Beethoven’s Sixth Symphony--the Pastoral Symphony. And judging by all the humming going on around here--and by the newspaper’s review--everyone had a great time! The first movement of Learn Hebrew Pod’s Symphony No. 39 will enhance our Hebrew vocabulary with words related to music, orchestras, and instruments. Then, in the second movement, we’ll acquire the ability to talk in Hebrew about nature and life in the country (just as Beethoven did using music in the Pastoral Symphony). And for the finale, we’ll be treated to a debut performance by none other than our fourth Hebrew building block--binyan pi-el. Do you want to become a Hebrew virtuoso? Stick with Learn Hebrew Pod . . . it’ll be music to your ears!